The set in a form of "attack mode". 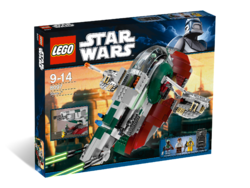 Although this is another complete redesign of the Slave I, the model carries over many of the features from the most recent previous release of the set, the 2006 6209 Slave I. One of the most notable features of the Slave I is the fact that the wings rotate with gravity. When the ship is picked up, or placed in a sort of "flight mode", the wings rotate to keep level with the ground as much as possible. Along the lines of the rotating wings is the interesting design of the ship, giving it the ability to land flat on the bottom, but take off and fly at a 90 degree angle with the base pointing outwards. There is a large, removable windshield which consumes most of the front of the ship. A small sticker is placed on the back of the top left of the windshield, as per the instructions, featuring a small Mandalorian symbol. Underneath the windshield is the cockpit, which features a pilot's seat and controls for piloting the ship. Behind the pilot's seat it the set's main defence system, a mechanism for launching four flick-fire missiles, without the need to flick them. These are released through an opening hatch at the top of the ship directly behind the cockpit, which has no floor. Towards the back upper half of the ship are two more opening doors on either side, both of which can open to reveal one more flick-fire missile, though these ones must be manually "flicked". These can be pulled out of the compartment, while still being attached, and feature a single, rotatable missile. Directly behind the back doors are the main blasters, which also rotate independently from each other. On both sides, slightly in front of the rear cargo hold are two small supply cabinets, similar to the ones found above the troop bay in the 2008 Republic Attack Gunship.At the very back of the ship, at the bottom under the top structure, is an opening door which allows access to the cargo hold. Because the ship is built in System scale, the cargo hold is only large enough to fit the new Carbonite Han Solo. The door can then be closed, covering the compartment. Unlike many other sets released in recent years, three of the four minifigures included in this set are exclusive to this version. Boba Fett features a completely redesigned helmet with detailed print and more accurate form factor. His helmet's mould is used by the Mandalorians from the 2011 set; 7914 Mandalorian Battle Pack. Included in the set is a bag of grey ARC gear, giving Boba the grey antenna for his helmet. He also has a standard blaster with a small grey pin attached to the end of it, a new cape, and the jetpack from the Clones in 7748. The cape is designed to look like it has been worn and ripped, and the jetpack is recoloured in sand green to match the rest of Boba Fett's armour. His torso has also been redesigned. Boba actually in this set, features an actual head, instead of his previous head, which was black to make the black markings on his helmet. His new head features the style of a Clone Trooper, but with a small beard and different mouth expression. Bossk features a completely new mould, also coloured in the sand green of Boba's armour, in a soft rubber, similar to Yoda's Clone Wars head from the set 8018. Han Solo is seen with a new torso, redesigned to look more accurate to when Han was released from his Carbonite trap. Also included is a new Han Solo in Carbonite mould. 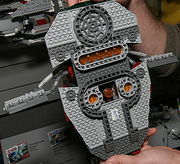 The older version of this "minifgure" was simply a design printed on a large brick. The new design features an entirely new mould with the shape of a minifigure frozen into it, just as in the movie. The minifigure design on the Carbonite mould also features the same print as the new Han Solo. Arguably the most interesting new feature of the new Carbonite mould is the ability to store the Han Solo minifigure in the back of it, by having him hold onto the protruding spokes. The underside of the ship. The Slave I was a prototype of the Firespray-31-class Patrol and Attack Craft, heavily modified by Boba Fett and his father Jango Fett. Both of the Fetts customised it with strong and advanced weapons systems. Soon after the ship was acquired by Boba, he took it to Kuat Drive Yards to have it modified again to fit his personal styles and needs. He added an ion cannon, concussion missile launcher, tractor beam projector, sensor mask, and jamming array. Boba Fett used the ship to track Han Solo to Bespin to capture him and return him to Jabba the Hutt to collect his bounty. The ship had also been active under Boba's control during the Clone Wars, notably since his father was killed at the beginning of the war. This is a description taken from LEGO.com. Please do not modify it. (visit this item's product page) Transport the carbonite-frozen Han Solo™ with Boba Fett™ and Bossk™ in Slave I™! Includes 3 minifigures: Han Solo, Boba Fett and Bossk! Slave I measures 13” (33cm) long and 13” (33cm) wide! An alternate view of the set. A view of the wings. View of upright position and cockpit. The cargo bay in opened position. The cargo bay in closed position. The flick fire missiles revealed. Facts about "8097 Slave I"
This page was last edited on 15 March 2016, at 06:12.